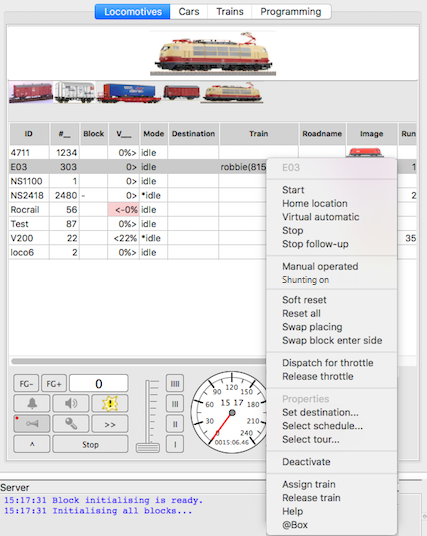 Essential Features for the automatic mode can be defined on a train instead of a loco. This will be useful when a train-oriented operation favoured, features defined in a train are omitted to the loco in case of a consist. In Rocrail parlance a train is a group of one or more wagons, to which a locomotive is assigned. Initially every car, used in creating a train, has to be created in the Car table. From menu tables the operator table is opened (Menu Tables → Operator and Trains). On tab Operator Index a new train is created. On tab Operator Control the name NEW is overwritten by an appropriate name for the new train. On tab Operator Train random cars can be assembled to the train using the Add button. If all cars have a way to identify themselves by RFID, RailCom or Barcode the block option "Assemble Train" can be used. The block must have a detector sensor to be able to scan the code of the in coming cars. If all the cars are in, the block command "Stop assemble train" can be issued to create a new train with the given ID. The train will be assigned to the loco already occupying the block. To view the progress in the Rocview Server windows the Calculation trace level must be activated. Cars can be removed from the train with the Disassemble menu items. By assigning a train to a locomotive a train compilation will be created. Basic function F0 like front light on/off or direction depending light changes are automatically synchronized by this assignment (especially loco from the control car). Option: Operators and trains, Tab: Train, select a train and a Controller pops up. It is possible to define 28 functions on train level. Functions are controlled by pressing "shift" at the loco throttle after the train is assigned to this loco. With this function, all the train decoders that are available are addressed simultaneously with the same function. If only the second variantion should be used for a train, then check the dialog "Only functions with shift work". The third variaton described below will not be executed. When a locomotive is assigned to a train -and the shift only functions in section 2 are not selected- accesses Rocrail all locomotive functions 1:1 of the train cars (basic functions, such as peak light on/off or directional light change). This is of particularly interest by locomotive and control car combinations. In addition, all other functions of the locomotive can be passed to the cars (e.g. headlights, interior lighting, …. ); this is necessary due to (possible) different types of decoders. In automatic mode Rocrail is allowed to enter a block depending on the length of a train or the block. This insures that trains only use blocks, which offer enough space for the current train to fully enter can and thus to avoid accidents due to excessive length. It is recommended to use values in millimeters. The length of a train compilation (loco & cars) will be automatically calculated and shown in the column "train" in the loco table. To make sure that a train fits into a block, the sum of the parameters minimum train length in block + length of the loco + sum of all lengths of all cars has to be less or equal to the block length. The values in all fields for the length parameters are integer. By using values in cm or inch the complete length of a train may be not exact enough in case of long trains. Rocrail is only comparing values, not dimensions. Therefore the dimension can be freely chosen (regardless of other statements). The location for a Train will be automatically updated if the Loco arrives in a block. After releasing this train from the loco, the train still remains in that block which is visualized as shown in the next paragraph. Note: A block with unassigned train/cars can only be used as loco destination if this block is set to Shunting unless the block Allows access in case cars are present in the block. The function of the cars shall be controlled by loco throttle. Every car has to be created in the Car table. when coupling F0 (direction dependent function, e.g. for a tail light) for this car select "direction" and "lights" with a check mark. enter a name for the functions 0-7 in each car. These should be different from the names of loco functions. Result: the car functions can be controlled by the loco throttle as long as the train is assigned to the loco.